Good morning, Alfie. It’s time to get dressed. The sun is shining and we have a busy day. Oh, that’s a pity, I thought Alfie might like to come to the park with me. Bert will be there. 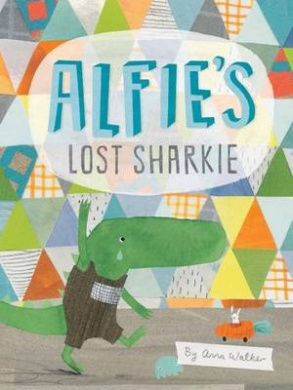 Alfie is a young anthropomorphised crocodile. Mum says they are going to the park and that Alfie needs to get ready. Alfie finds all manner of distractions get in the way. First there’s breakfast, then the process of getting dressed. Mum offers to help but Alfie wants to do things Alfie’s way. Illustrations are a mix of pattern and collage and more. Mum is relentlessly patient and encouraging, but time is running short. Eventually, Mum and Alfie reach the park, ready to play. 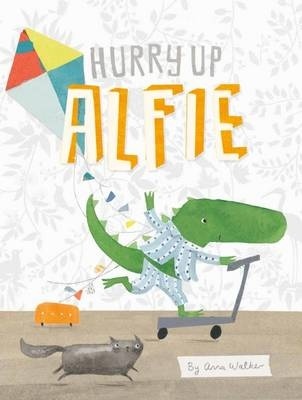 Hurry Up Alfie is a delightful observation of a day in the life of a small child. Alfie is easily distracted but simultaneously easily entertained. Meanwhile, the reader can see both familiar and different elements in this particular home and its routines. There are plenty of details to pick out and they will enjoy watching Steve McQueen the cat as he joins in or stays safe from Alfie’s antics. Parents will recognise the challenges, and the futility of trying to hurry an imaginative and self-entertaining child. Recommended for pre-schoolers. An activity book based on Ollie’s ‘I Love…’ books. Spot the difference between pictures of Ollie preparing for a beach trip; join the dots; colour and draw; add your own touches to a seascape and garden, using stickers and colours. And plenty more, besides! Ideal for anyone who loves Ollie. Ollie, the main character of the ‘I Love…’ series from Anna Walker is an androgynous striped zebra. Or ‘everychild’ in a pyjama suit. In previous outings, Ollie has loved his Mum and his Dad. Ollie also likes holidays and Christmas, to sing and to dance. Ollie even has his own ‘I Love Ollie’ font that’s used for his stories. I Love My Grandmais about Ollie spending a day with Grandma at her house. They have a picnic, a singalong and a bath. And all the while Grandma is knitting. At Grandpa’s house, Ollie and Grandpa are ready for a day of gardening. Ollie helps as only a small child can, as they weed and harvest in Grandpa’s vegetable garden. At the end of the day, the two share dinner and a chat and then doze off in the chair. Illustrations are watercolour with lots of white space. Endpapers depicting a child’s drawing of the day’s activities echo the colours on the front cover and spine. And cuddles. Both Grandma and Grandpa offer the best of cuddles. Each of the ‘I Love…’ books tells the story of a day with Ollie, from Ollie’s point of view. Text is simple, with the illustrations illuminating the words and reflecting a sometimes different story. But they are full of the simple joys of just being. As with previous offerings in this series, children will enjoy Ollie’s adventures and adults will appreciate the relationships depicted. Ollie is full of life and curiosity and love. These are small format almost square hardback picture books, sure to be a favourite with littlies and with their families. Ollie B is a small zebra-ish character who invites the reader into the everyday. In this outing, Ollie shares a day with Mum. Ollie helps with Mum’s jobs and then they go for a walk. The walk is full of the ordinary and extraordinary. The day ends with a wonderful bedtime hug. Illustrations are soft and evocative watercolours, full of colour and movement. I Love My Mumis a smallish hardback, styled as others in the series. Ollie could be boy or girl. Readers will make their own decision. And it doesn’t really matter. I Love My Mumis full of the magic of everyday, celebrating the simple things that fill many days for Mum and small child. Learning is gentle. Familiar things become new through the eyes of small children. The size of I Love My Mumis perfect for little children who can follow the story in the illustrations, with or without the words being spoken. Ollie, who has featured in several titles in the last two years, is back to share the relationship he shares with his dad. Actually, there is no indication of Ollie’s gender and readers can choose whether or not they wish to assign gender. Ollie is a small, striped anthropomorphic zebra who shares his world with the reader. In I Love My Dad Ollie shares the wonderful ordinary elements of a father-child relationship. Ollie and his dad climb trees, make cakes and more. Illustrations are watercolour on mostly white pages. Text is simple and minimal, in a clear handwriting font. I Love My Dad is a small square hardback book with bright yellow endpapers with naïve sketches of tree branches and birds. Ollie is a loving and very likeable character, a young child clothed in zebra coveralls. His world is simple and defined by the relationships he shares with those around him. There is the overt relationship with Dad but there is also Fred, his dog, a sister and a teddy to take to bed. Walker uses few words and it is the spaces between her words that speak loudest. Her images are deceptively simple too, but pack a full emotional punch. Small children will relate to the action, from the swings in the park to piggyback rides and the cooking with Dad. Recommended for preschool-aged children. Little zebra, Ollie, takes the reader through a normal sort of day, the sort of day familiar to many mothers and small children. There are everyday tasks like washing and going for a walk. But everyday tasks are new to little people and there is mystery and adventure in the simplest of tasks. The text here is very simple and there is magic in the illustrations. Anna Walker has used watercolours and ensured plenty of white space remains. Ollie is a small stuffed toy, perhaps a zebra, and Mum is a slightly larger version. I Love My Mumis a small format hardback book, perfect for little hands. Anna Walker’s illustrations are just beautfiul. Her gentle watercolours set in white space allow plenty of room for the reader to bring their own story. It’s easy to imagine sharing I Love My Mum with a small child and revisiting their day or their way of doing things. Walker’s use of an androgynous toy as main character allows wide appeal, although with the pink detail on the cover, it’s most likely this will be a treasured book for a small girl. A lovely book. Recommended for 3-5 yo children. www.clairesaxby.com. This book can be purchased online at Fishpond. Buying through this link supports Aussiereviews.